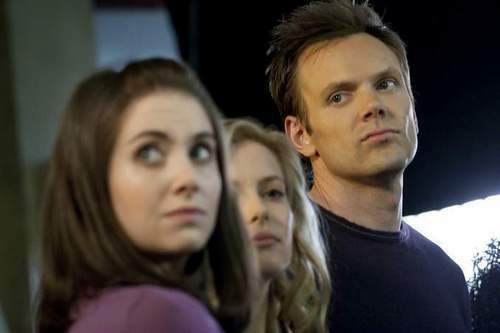 ''Community'' set photos.. Alison Brie, Gillian Jacobs and Joel McHale prepare to act during filming of the 'Environmental Science' episode of Community. October 2, 2009. Wallpaper and background images in the Community club tagged: community nbc season 1 2009 set photos the cast. This Community photo contains پورٹریٹ, آرچر, closeup, تصویر, and ہیڈشوٹ. There might also be تفریح ​​یہودیی and تفریح پہن.